Minus 36. I think that was what DH muttered to me on his way to work this morning. I was pretty groggy, having been up half the night drowning in post-nasal drip from the cold in my head. 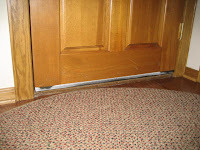 Yup, I see frost under the front door. Pretty cold outside, too. But -36 was the windchill. It's really only -13. 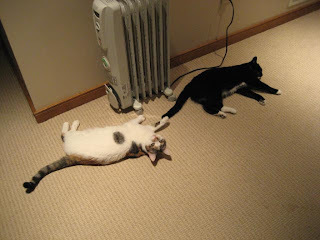 The kitties have decided that downstairs with the new radiators is the way to go, avoiding the freezing drafts emanating from the windows. Sharae was not keen on sharing, but Cricket convinced her there was room enough for two. I have a rare Wednesday when I am not scheduled to be outside all day, and if I'm not feeling considerably better by this afternoon I'll cancel my appearance at church orchestra rehearsal this evening. No, you know what? I'm going to do that right after I finish here. It would be pretty dumb to go to rehearsal and spread these germs around - to what end? To see how many others I can knock out before Sunday? Curses on whomever carried the ones that felled me into a public place. The other kitties are doing their morning jobs. Madeleine is stretched out on the bathroom sink. 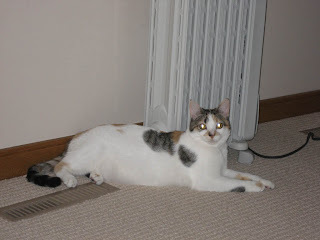 Sharae moved from the radiator and is now cuddled with GiGi on top of the Colonade. (Either Cricket prevaled, or Sharae has a short attention span.) 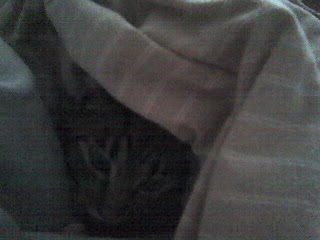 Seri has busily burrowed under all of the fleece throws on the bed, making herself a cozy little nest. See more kitties riding on the Friday Ark this week. When I adopted Cricket from the shelter, I told Madeleine she would be her kitty. That didn't work out so well, because though Cricket was anxious to make friends, Madeleine was too shy. 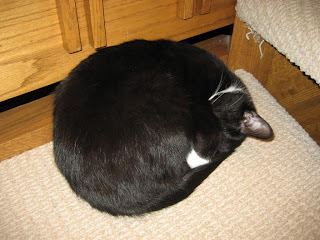 When I adopted John from a rescue group, I told Cricket he was her kitty, since Madeleine usually ran away instead of playing and I knew Cricket was frustrated. That worked out great, and John and Cricket became pals. 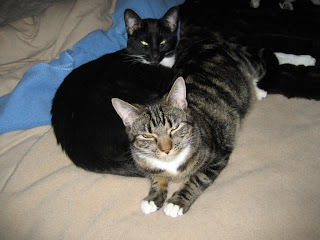 With the stripey girls staying with me from 4-6 months now, they are entrenched parts of our household. We are just getting to the point where the girls are going to be cleared medically to be adopted, but I am not sure I am going to be able to let them go. Everyone is getting along with everyone, and six feels just exactly right. My only complaint is that there is not a lap cat among them. These are typical scenes that I captured over the weekend. Popular warm spots for daytime napping are the bed, with a goose-down comforter, lots of fleece and faux fur, and a new oil-filled radiator in the bedroom, The Beach in the kitchen, and believe it or not, the bathroom sink and counter. When we remodeled, the new master bath was carved out of the mechanical room. It's separated from the furnace by a thin sheet rock wall, and turned out to be quite toasty while the furnace is running. Gigi is John's kitty, though it's really more the other way around. Gigi has a crush on John, having had her heart broken twice, when each of her brothers left. 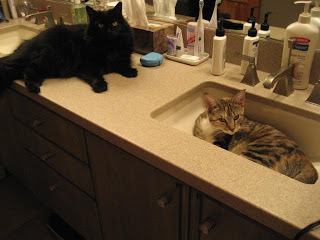 And even shy Madeleine has a kitty, Seri, who enjoys hanging out in the sinks. Madeleine has really blossomed in this household of six, something I never imagined would happen. Is this the end of fostering? Are we going to keep the stripey girls? You may remember that Sharae was born in a very rural area, 'way up north, where it is very, very cold this time of year. I don't think she was genetically predisposed to survive in that environment. As soon as it got a little cold here she began spending most of her day by one of two floor registers in the kitchen or on The Beach, as we refer to the towel at the end of the island. Yes, there is usually a cat on what is technically a kitchen counter. We got tired of chasing cats off the island, and finally realized there was good reason they disobeyed. Not only can they efficiently survey the house from that perch, but it's warm under the spot light located directly overhead. We capitulated, put a towel under the light, and have trained them that they are allowed there on the island, but only there. Right. But mostly, anyway. If they are somewhere else on the counter, their name said in a stern voice while pointing at The Beach is enough to send them scurrying to the safe zone. Back to Sharae. It's been subzero here for the past week, and at those temperatures we can't keep the upstairs warm enough to keep the chill out of the downstairs. I finally purchased a couple of oil-filled radiators, and they are wonderful. It didn't take long for Sharae to find a new favorite spot. The best orchestra I have ever played with was a local university orchestra that needed a few community players to round out the sections. We rehearsed twice a week, and had sectionals... I don't remember exactly how often, but it was at least monthly. 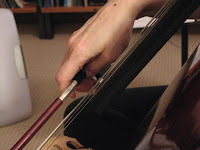 The principal cellist was responsible for marking bowings in the parts, with assistance from the faculty section advisor, and additional fingerings were discussed in the sectionals. It was heaven, and hard work. But productive work. At my last orchestra I was principal cellist for the last number of years, which meant at least I had some control over my/our destiny. We formed a cooperative within the section and hired a local pro to mark our parts (actually to mark a master part, then we did the copying) and to run two or three sectionals for each concert cycle. That was worth every penny; we learned so much, and it made the performances so much more enjoyable. My current orchestra is a typical, small amateur orchestra with limited resources. Our principal cellist is a very competent player, and personally a very nice guy. But he doesn't mark bowings, and frequently changes them from week to week. That leaves everybody else playing tensely, ready to change bow directions at any moment to stay in sync. And we're all on our own to figure out the fingerings. Tchaikovsky and Brahms. Who has time to practice? I'm too busy figuring out workable fingerings to bring anything up to speed or make it sound beautiful. Still searching for a good way to replace my practice journal with some sort of on-line equivalent, I've set up a sister blog for recording those nitty-gritty lesson and rehearsal notes and time logs. For some reason I find myself resistant to posting those here. I think maybe I feel a little too much desire to please my few readers, and not totally bore you with the details. However, in the event that some one of you is interested in following along, my new blog is actually entitled gottagopractice. At least I followed the rule of reflecting the blog name in the address this time. You'll notice that it's on Wordpress instead of Blogger, and the only reason I did that is that it's relatively easy to make a grid in a Wordpress post, and extremely tedious to do that here. (I like the Blogger widgets much better, though.) I'll put a link to the feed in the feeds section of my sidebar. 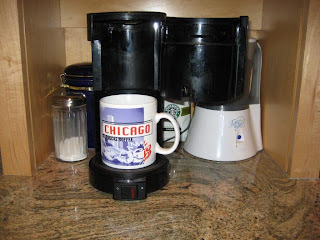 This post is for Emily, in response to her comment on my coffee pot disaster. I wanted to include a picture. 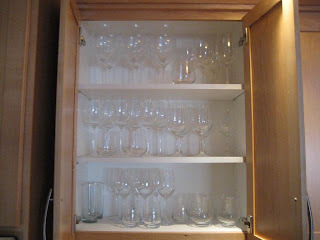 What you see is one of my two dish cupboards, filled with wine glasses. We don't consider Riedel a luxury in this household. But I hear you about the hand hazard that broken glass poses. We have had a couple of glasses break through the years, always when hand washed. We wash them on the top rack of the dishwasher now, and have had no casualties yet. As long as the water is properly softened and we use a rinsing agent they come out sparkly clean. Too bad the dishwasher is not very good at crusty coffee gunk. Writing about dinner yesterday got me thinking about these photos of some kitties who live with one of my friends, a fellow foster parent. 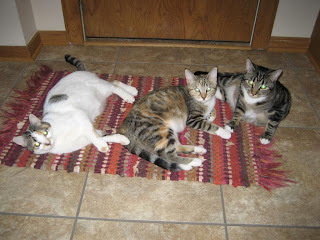 I snapped them at dinner time as we were preparing for an adopter to visit. What do you notice about these kitties? 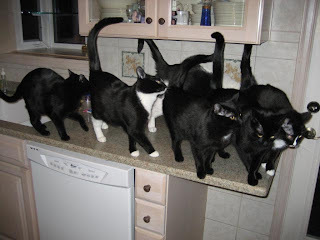 Well, yes, they are up on the kitchen counter, bad kitties, but they were awfully excited about dinner. I mean, what is the overall visual impression here? I see black. I see a sea of black. And a little white for contrast. Isn't that interesting? 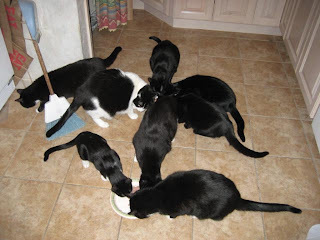 A house full of black and white cats. It turns out that black cats are the slowest to be adopted, a fact which leaves me mystified. I love black cats. They're so practical. They rarely shed, and when they do, the hair is black. Which means it's much harder to see on your clothes and furniture, anyway. But they're also harder to see in photographs, and since many adopters search for kitties on PetFinder these days they don't compete as well as their more photogenic compatriots. 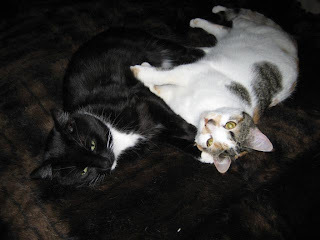 Which occasionally leads to pictures like these: a foster home enriched in black and tuxedo. There was a cute story making the rounds about a shelter that changed the name of one of their long-term black residents to "Jelly Bean". 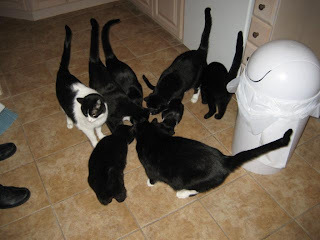 They were amazed when that cat was quickly adopted, and proceeded to name all of their black cats Jelly Bean, hoping to continue cashing in on that subliminal association. In fact, we read that story about the time the Sausages were born. That's Jelly, the tuxedo front and center on the kitchen counter. Not Jelly Bean, but Jelly Belly. I'll have to tell you the story of the Sausages some time. The other interesting thing to note in the photo are the tails. Straight up. Veeerrry interested in what's going on, which is dinner. The can is temporarily on the floor, with kitties following. Just one can, though, which means that most can't get to it, so tails are still raised high as interest mounts. At last, food on dishes, and the tails are now in I'm-busy-eating mode. Beautiful. If you're thinking about adopting a cat, don't forget to look at the black ones. 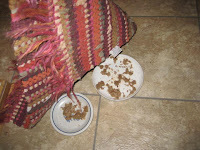 Feeding six cats at a sitting can sometimes be a challenge, especially when three of them are adolescents just learning table manners,and one is very shy and easily scared away from her food. Once the kittens reach a certain age I move from a communal plate to individual dishes to help them learn self-control, and to more easily police meals so everyone gets a chance to eat. That's easy with two or three, not so easy with six. The routine that we have settled into is that the three little girls get their plates in the mud room, I shut the door to the kitchen and feed the bigs there. After they (the bigs) have clearly eaten all they want, I open the door and the not-so-little-anymores usually clean the plates. As long as dinner is something they like. Sometimes it's not. We went through a few trials of new food last month, trying to help John eliminate cheese and grains from his diet to see if food allergies might be playing a role in his gingivitis (probably not). With a few of those meals, this is what I found when I opened the door. What's that? 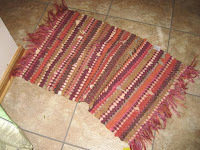 A rug? Well, yes, it's the rug by the mud room door, usually the place to leave wet shoes when you come inside. That's what Mud Rooms are for, primarily, or in addition to a place to feed kittens. Back to single digits this week; I need to dig out my gloves again. I know I am acclimatized because I've been walking around with unzipped jacket and no hat or gloves while the temperature has been below freezing, but zero Fahrenheit still feels cold to me. It's cold for the critters outside, too. 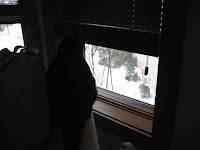 Last night D- and I were discussing cat tracks in the snow around her house, and how to rig up a warm box for any stray kitties outside (a styrofoam cooler filled with straw was recommended). We haven't seen chipmunks for over a month, since the first real snow fall, and we probably won't until the snow finally melts... in a few months? But the bunnies are still out. 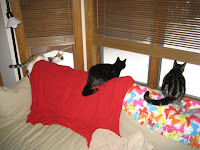 Occasionally they will make their way up the walkway in front of the house looking for something to eat or a little shelter during snow storms, much to the delight of any kitties stationed near the den windows. 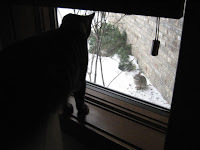 Funny, though, that I am often the first to see the bunny, even when there is a kitty on window overwatch. Look, GiGi, can't you see? 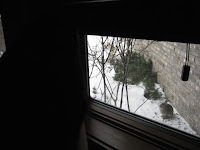 There's a bunny right outside the window. 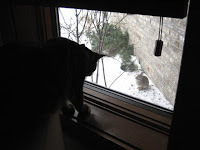 A little motion (on the part of the bunny) helps, but if they stay in place long enough the cat will finally stop focusing on my wild gesticulations (what's up with Mom?) and look far enough outside to see. A still shot doesn't quite capture the whole story. Sorry, YouTube seems to be having some issues this morning. You'll have to stop back later to see the video clip. Or, what the heck, I'll try out the Blogger video upload feature. We had a minor disaster on the home front yesterday. I had set the coffee carafe to soak in a sinkful of soapy water, partly because it needed to be washed (how many months?) and partly because DH had run the sink to soak another bowl, and it was, well, there. A bit later DH decided to scrub the pot, a very generous impulse, especially as he doesn't drink coffee so the grunge in the pot was all mine. Shouting coming from the direction of the kitchen is never a good thing, and yesterday it was his spontaneous eruption resulting when the pot slipped from his hands, shattering the lip of the pot and punching a large hole in the side, then poking a good-sized wound in his hand. Not a slice, fortunately. He probably bounced it against the broken lip of the pot. We got the bleeding stopped and the wound cared for, then DH began encouraging me to get a new coffee pot. But I am not really interested in a new pot. This one is scarcely more than 15 years old, and works fine. I just need to find a new carafe that fits, and I told him I would make the coffee directly into my cup in the meantime. That shouldn't be too hard; I only make one cup at a time. DH had dug through the cupboard and found my largest mug, then placed it on the warmer in the coffee maker. Wasn't that thoughtful? After I expressed my delight and he went off to work I started thinking about the languages of love. Actions speak the loudest to me - words are too easy to say and not really mean anything, or in fact can misrepresent the truth. I have assumed for many years that actions are most important to DH, too, but this morning I realized that there is something I can do for him that speaks even more loudly: express my appreciation for his actions. He lights up whenever I do that. I can't believe it took me this long to notice. I have a new toy: a FLY Fusion Pentop Computer. It was sort of a late Christmas present, and I bought two, one for DH, and one for me. While marketed as a children's homework assistant and game machine, a couple of its basic functions looked very interesting for grown-up uses. The simplest thing it does is to record everything you write (using special paper with thousands of virtually invisible gray dots) and transfer it to your desktop computer, where it is retrievable both as a picture (jpg) and as text using OCR into Word. There is also a nifty music application for composing and playing music that I haven't tried yet, and of course the ubiquitous mp3 player capacity. And the darn thing talks to you, to assist and tell you when you've screwed up. I bought it for DH to use to capture all of those brain-storming back-of-napkin meetings he does, and he's pretty excited about the possibilities. There are a couple of new habits to learn - carrying the pen and paper along, learning how to use the pen without having to think too hard, uploading and organizing the notes - but this could be a great alternative to trying to capture notes on a computer or PDA on one hand or figuring out how to file and use the scraps of paper on the other. For me, I'm still looking for efficient and useful ways to record my practice log. The first thing I thought I'd try is a simple log entry system, where I record a few notes about what I did at the end of each practice block or rehearsal. Here is the result of my first try using this thing. I obtained this image by e-mailing it from the FLY application. One of the options after you have uploaded a page is to distribute it as a jpg this way. You can see that a few of the beginning words don't appear. That's because I didn't tap on the "FLY Notes ON" button before I started writing. The front cover of each notebook contains lots of control buttons that are activated by tapping with the pen. It's like a little computer on cardboard. The reason that there are only a few words missing instead of the whole entry is that the pen recognized that I was writing without having given it instructions on what to do with the writing, so it spoke up and told me so. It also suggested that if I just wanted to record my writing I tap the "FLY Notes ON" button. Thank you very much! Certainly not perfect, but recognizable. You can import pictures by telling the app not to convert them, but I'd have to look up how to do it. It might be better just to use a text equivalent instead of an eighth note symbol. And I have to remember to write my "8" with a singe stroke instead of two circles, because the pen uses the drawing of a circle to identify applications and that confused it. So, the pen seems to work pretty well, and I'm looking forward to playing with it to discover other functions that might be useful. And I'll experiment this week with using it to record my practice log. 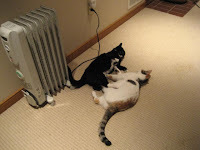 One very fun thing about watching kittens grow up is observing the way they model the behaviors of the older cats. 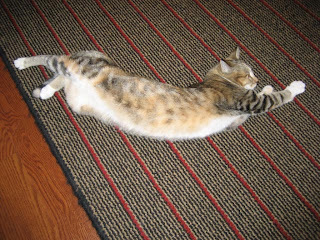 Seri started doing this only a month-or-so ago: a nice, big back-bending stretch, offered spontaneously when she sees me coming towards her. She's a smart little lady, and knows that if she offers me her belly in such a beguiling way I will almost always stop and give her a full body rub before I continue on. But this is where she got the idea in the first place. Observe Aunt Cricket's lovely curve. It's Tummy Tuesday. 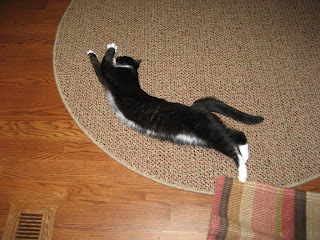 To see more of the (feline) sunny-side-up variety, visit LisaViolet's Diary. 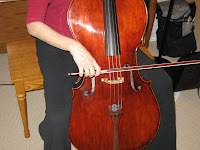 January is Bow Month at The Stark Raving Cello Blog, and this is my entry. My bow hold is still a work in progress, and a major topic of discussion at my lessons. The primary change T- initiated was the thought of a "bow change motion," where the wrist, hand and fingers flexibly respond to the change in bow direction initiated by the arm. T2- used to say "hand motion is reactive, not generative," so this was a continuation of the same general principle. My thumb is curved, more when at the frog than when at the tip, and tends to straighten, especially when I am trying to hold on too tightly. My major fault is that the bow comes out of the string when I change direction. That's much, much better than when I started on this path, so I am hoping that when I repeat this experiment next year I'll be able to see the progress I intend to make. 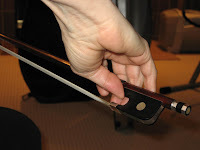 Other things I note are that the back of my hand remains relatively parallel to the floor, and because there is little obvious pronation (which T- calls "the P word"), my thumbnail tends to be perpendicular to the bow rather than parallel. One advantage of this angle is that it really hurts to grind the edge of my thumb against the sharp edge of the frog, so I am rewarded for relaxing. A disadvantage is that, particularly since I have a very tapered thumb tip, my thumb tends to slide between the frog and the thumb pad. It's something I constantly struggle with, and because it's not easily seen my teachers haven't been able to help much with that directly. My little finger lies near the button on the frog, and T- teaches an upward lifting on the frog with the 3d and 4th fingers when the bow is at the tip in order to add weight to the bow without excessive pronation. Isn't it fascination how many different variations there can be of doing essentially the same thing? Dragging the bow back and forth across the face of the cello seems like it should be such a simple thing... until you try to do it! 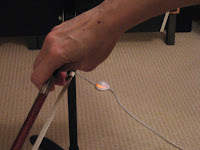 And here is the bow in action, just playing an open G string. ...and I know how to get there. Actually, it's the key to shifting. I've mentioned this lesson point tangentially on several occasions, and thought I'd fill in the details for easy referral in the future. Where am I going? What note is it? What is the interval between where I start and where I end? Where is the note located - what position am I going to, and which finger am I going to use to play the note after the shift? How am I going to get there? Whenever I muff a shift in my lesson, T- barks out "finger, string, stroke." ????????? That's shorthand for "describe to me exactly how you plan to do that shift." And there are exactly three possible answers to each component of that question - new, old, same. Which finger are you shifting on? Old - the finger that is already down on the first note. New - the finger that will be playing the second note. Same - the same finger plays both the first (before the shift) and second (after the shift) notes, so the shift is made on that finger. Which string are you shifting on? Same - the easiest one, when both notes are on the same string and you are shifting up or down that string. 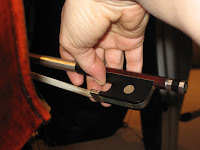 Old - shift on the first string, then cross to the new one to play the second note. New - cross strings first, then shift on the second note string. Which bow stroke are you shifting on? Same - again the easiest choice, and the correct answer whenever the the two notes at each side of the shift are slurred. 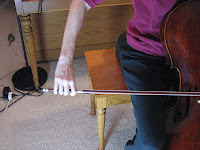 Old - shift before changing bow direction, which means the finger is in its new place and ready to play at the beginning of the next stroke. New - shift after changing bow direction, which results in a little "mew" before the second note that can be milked for an expressive slide or masked by slowing the bow speed. Early in my sight singing study I used to whine that I could hear the note in my head, but I couldn't seem to get it out on pitch. When my teacher told me again and again, with more than a little amusement, that the reason I couldn't sing it was that I was not actually hearing it, I argued. Fruitlessly, as it turned out, but it helped pass the time until I could finally hear the note, and then sing it. Now I know that whenever I can't sing one of my pieces, it's because I don't know the notes well enough to hear them. My shifting journey has followed a similar path. Whenever I am having difficulty with a shift, the solution is clear. If I'm missing the destination note, I make sure that I truly know where I am going by singing the note and describing it's location by position and finger. Then I make sure I know how I am going to get there - finger, string, stroke - and practice those elements slowly. 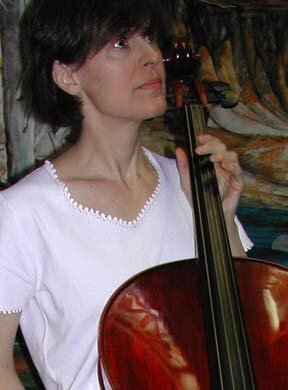 Just got back from running errands, which included returning the lovely 230 year-old French cello I have had on loan while the cello to replace the one that disintegrated with multiple cracks last winter was being built. And... it's here! I visited it for the first time today, unstrung and seams open for a few weeks while it acclimatizes. It's really, really beautiful. The back is a 75 year-old piece of subtly flamed maple, with a spruce top more finely grained than my original. It's antiqued, on a butterscotch base, and really looks old to my admittedly not well-trained eye. I hope, I hope, I hope it sounds and plays as beautifully as it looks. Keep your fingers crossed. I really didn't mean to take off a whole week from blogging over the holidays. Events conspired against me. DH was off from work the whole week, shades of things to come should he ever decide to retire. It's good to be forewarned that there are adjustment problems ahead. I will have to get over feeling like I need to keep him amused, and he will have to learn how to amuse himself when he is not occupied with professional projects. Speaking of professional projects, the biggest reason for my lack of blog time was that I did four hours of continuing education each day for the week. I hate it when I arrive at year end without having gotten all of my hours, and am very glad that there are reasonable options now for studying on-line. And also that I realized early enough that I was short 24 hours so that I could break it up into four-hour chunks and still finish on time. I'd make a resolution that this year I'm going to get done earlier, but I did that last year and it didn't work, anyway. Like many others, I felt the "clean up the nest" urge as the new year approached. "You can have 30 minutes," DH said, when I suggested we organize his professional journals, stacked willy-nilly on five 7-ft tall bookcases in the office. I admit to an ulterior motive - I wanted to completely unload the center case so I could pull it away from the wall to check whether Holly, our Christmas visitor, was hiding behind them. But that's another story. The end of this one is that eight hours later he was still jokingly saying "30 minutes." It's not done, but we left the remaining shelves for another day and congratulated ourselves on how much better the 80% we finished looked. Most of my lessons and rehearsals are curtailed until next week, but cello lessons continued, and last week's was exceptionally good. I had planned to play the C Major 4-octave scale, but T- asked for f# minor instead. Other than a momentary mental lapse moving from the D to the A string, that went well, good intonation and overall sound. Hah. Then I played the second half of Lee's melodious etude #7, again with nary a comment. We touched briefly on #8, which I have done once before, then went on to #9. Red letter day, as I haven't gone beyond the first eight in 2 1/2 years of working on them. As the next student had arrived and we were wrapping up he asked which concerto I was working on. I said "Saint Saens," half in jest but also because I have been exploring it for a few weeks, encouraged by Emily Wright's interest in using it as material for a podcast on slow practice. T- did not take it as the least bit of a joke, but, obviously delighted, launched right into a mini demonstration on approaching the double stops on page 2. So that's it - I'm committed now. Thanks, Emily. And now for the weather. It's up to 12 degrees F today, and it's not snowing. Woo hoo!